Larson Electronics, a leading manufacturer and distributor of high grade lighting equipment, has announced the release of a new powerful explosion proof light fixture that provides operators with an energy efficient alternative to traditional hazardous location luminaries. With more and more industries needing explosion proof lighting, this innovative solution will be in high demand. The EPL-HB-11K-LED from Larson Electronics is a Class 1 Division 2, Class 2, and Class 3 explosion proof LED light fixture that provides 10,997 lumens of high quality light while drawing only 112 watts of power. LED technology and a compact design make this lamp an excellent replacement upgrade option for older, bulky and high maintenance cost fixtures. The copper free aluminum alloy body is powder coated for added durability and aesthetics. 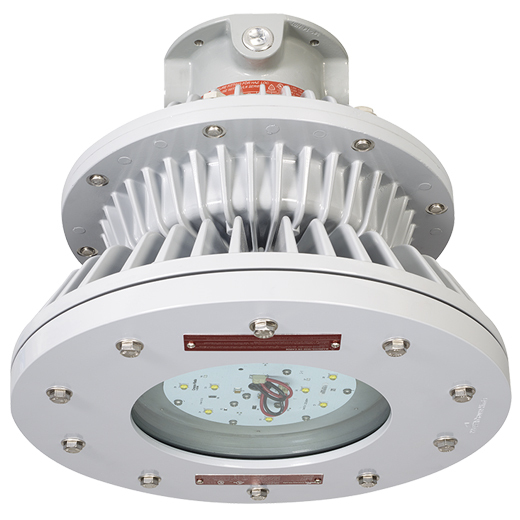 A special heat dissipating design in conjunction with LED technology helps this fixture achieve an excellent 60,000 hour rated lifespan. The light weight and low profile of this unit makes it an attractive alternative to larger and heavier older fixtures. This light is universal voltage capable and can be operated with 120-277 volts AC without any modifications. 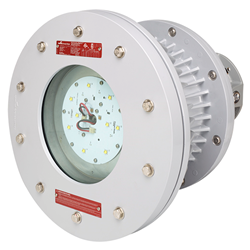 This explosion proof LED light fixture carries an IP66 rating for ingress protection, rated for marine environments, wet locations, and hose down areas. This LED luminaire is shock and vibration resistant with no filaments or glass components that can break or shatter. This fixture is a pendant mount unit and incorporates a ¾” threaded hub for wiring.